Post subject: The $2, 500 chook! Yes - and it's real! Thought I had seen all the chook world had to offer until I saw this! Last edited by TookTook on Sat Apr 02, 2016 12:32 pm, edited 1 time in total. Post subject: Re: The $25, 000 chook! You may wish to drop one of the noughts / zeroes.... the story says $2,500. Still a lot of money for a single chook !! 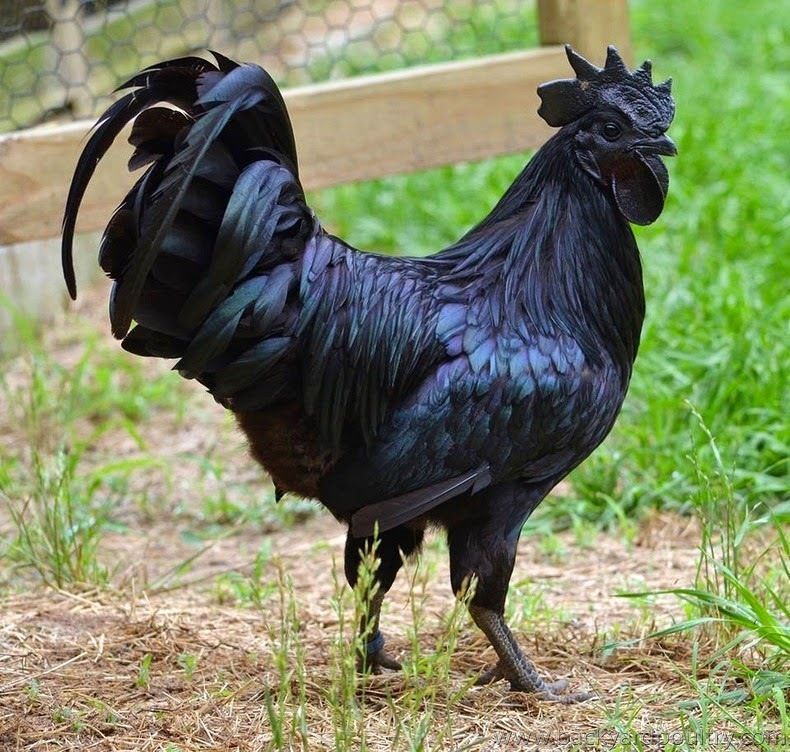 Post subject: Re: The Akl Black $2, 500 chook! Here is the pic...an amazing looking bird! Apparently the only parts of them that are not black are their eggs, which are white. Reading that article, I can only assume that they are a little more affordable in their native country because that's an awfully expensive ritual otherwise. I've just re-read the article & realised that the person who wrote it is definitely NOT a poultry person ! "...being poor sitters, they don’t roost and therefore the only way to hatch eggs is to incubate." Can't help but picture a chook trying to hatch eggs whilst roosting. What is a reasonable thing depends on the person. Would I sound old if I can remember when deer, ostriches and emus fetched outrageous prices. They are surely the most expensive chickens in the world!?! It's an extraordinary looking bird - quite beautiful. In Australia higher prices than this are sometimes charged for some gamebirds that are sold on the black market for illegal activities. We also have that pair of Toulouse that were sold at auction for a very high price - might have been something like $1600. I agree - I find that Rooster quite hypnotic...I cannot truly believe it is real and am now desperate to see one in real life! I guess so Took Took. Customs will never let one of those through, let alone a breeding colony. It actually wouldn't be horribly difficult to create something that looked similar on the surface. The Australorp and other pure-black-bird genetics often throw up what's called "gypsy-face", which describes black pigmentation on the face, comb, and wattles of the bird. I've seen it come through my pens not a few times. Cross that to a black Silkie with a good "mulberry" combs to get the black bones, skin and flesh, and the outcross back to the Australorp to fix the black eye and legs and size, then just keep selecting for the darkest face and looking for other gypsy-faced birds around the place. Or a black Araucana, for a green-egglaying, green-sheened, black bird. Yes as it happens I found a detailed thread by Mr Holland who is doing just that Infoaddict! Will see if I can locate thread..always tricky navigating on my phone.